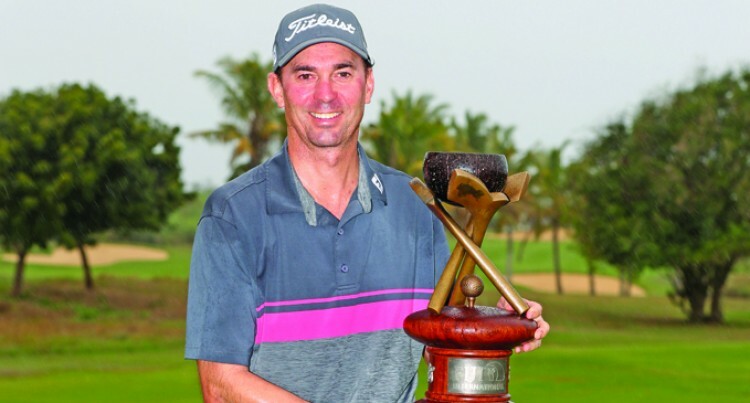 One of the most popular win­ners in recent memory on the ISPS HANDA PGA Tour of Australasia, Norris, (or ‘Norrey’ as he is almost universally known), is champing at the bit to return to the Natadola Bay Championship Golf Course in 2018. Last year’s four-shot win was an emotional one for the now 45-year-old, among the spoils of victory a lifelong dream come true with a year’s access to the European Tour and a two-year ticket on the Asian Tour. Now 12 months on the feel-good factor is still high for Norris who says he has ‘nothing but great memories’ of his win last year. “The dinners, the welcome cer­emony, the pro-am, the media in­terviews….just everything, that’s what I’m looking forward to,” he says. As tournament week approaches Norris is inevitably being asked if he thinks he can win again but he says that’s not the best way to ap­proach the week. “I’m confident of playing well again,” he says, “but in golf that’s no guarantee of winning. “The line between finishing in the top-10 and walking away with the trophy has never been so fine and the depth in the game at every tour­nament is amazing. The key to producing the sort of golf capable of winning, he says, is to simply enjoy the week. “Some courses just fit your eye and Natadola Bay is one of those for me,” he says. Adding to his confidence is a body that’s finally feeling healthy after a year battling an injury that hasn’t allowed him to play the sort of golf he would have liked on the Euro­pean Tour. But with the back issue finally behind him, he says it’s full steam ahead for the remainder of 2018- starting in Fiji. “It’s been frustrating because I just haven’t been able to play my best but these last few weeks I’ve re­ally felt much better and I’m ready to go,” he says. While his golf might not have been fun for much of the year, travelling to Europe with his family has been and it’s an opportunity he’d love to have again. “I’d probably do it a bit differently next time because it’s a fair bit of work travelling with the whole fam­ily,” he said. “But it’s been a phenomenal ex­perience. My wife has really loved every minute of it and the kids have too, for the most part. During his time travelling the world Norris says he has become an active ambassador for Fiji and the Fiji International presented by Fiji Airways, a tournament he counts among his favourites not solely because of last year’s win. “It’s a great example of how a tournament can be a win-win,” he says. “It’s such a big and important event for the local people and con­tributes to the area in a really sig­nificant way. While Norris couldn’t be happier to have won last year the feeling is mutual among tournament organ­isers. “Jason is, and has been, a fan­tastic champion,” says said Gavin Kirkman, chief executive officer of the PGA of Australia which owns the ISPS HANDA PGA Tour of Aus­tralasia. “He’s one of the most popular players on the Tour for a reason and he’s shown his class this past year as he has travelled the world pursuing his dreams. “But perhaps more importantly, he really ‘gets it’ in terms of the tournament and what we’re trying to achieve. “Yes, it’s great to win the trophy at the end of the week but the goal is to have a lasting impact year-round and Jason continues to do his bit in that regard.